The Funky Felter: What do an owl, pig, and octopus have in common? They are all now felt finger puppets and a great kid's craft project for the summer. What do an owl, pig, and octopus have in common? They are all now felt finger puppets and a great kid's craft project for the summer. So for those of my readers who are die-hard traditional feltmakers, you'll just have to turn your back to this post. I know that those who wet felt or needle felt ordinarily don't use inexpensive craft felt in their creations (or at least that it what I've found among my fellow feltmakers), but kiddie craft felt does have its place and can produce some super cute children's stuff. Over the weekend, I was being a bit nostalgic for the days of pigtails, barbie dolls, and lollipops so I bought a stack of thin craft felt and had a blast cutting, pasting, and sewing some kid-friendly toys and accessories. I had forgotten how easy it was to use the pre-made sheets of brightly colored felt and fun too! Don't get me wrong - I'm still in love with my traditional feltmaking techniques and will continue to create primarily this way, but it is certainly nice to experiment once in a while in another media. I rediscovered the many uses of craft felt and found that you certainly don't break the bank doing projects with it. I think that I spent less than $10 for all my supplies - craft felt sheets, eyes, pompoms, embroidery thread, and glue. 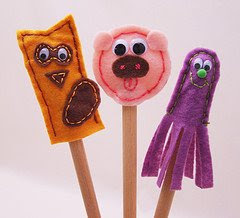 Craft felt projects would be a really wonderful inexpensive way to fill some summer days for your kids too. And, even though it is nice to have some instructions and a plan, you don't really need it. I made all my little projects over the weekend just off the top of my head with no templates. It is super easy! So, although I advocate teaching your kids to wet felt and needle felt too, the occasional craft felt project can be a fun-filled time with super cute results. 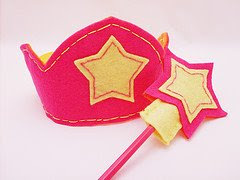 **The craft felt projects shown above include animal finger puppets and a princess crown & wand that I made. I think that for kids to work with craf felt is much easier and cheaper in a way. Im a traditional felt maker and have never worked with craft felt, however, I dont think I would want to spend time fleting sheets of yummy merino wool so my kid then cuts it all up and glues noodles onto it! hahaha nothign bad with that...but I would feel sad for the felt!